Amit's father had a severe stroke last month. Amit had bought a mediclaim policy for his father earlier so he thought all the medical expenses would be covered under the plan. However, it wasn't the case. Amit received only the expenses incurred during hospitalization and that too on reimbursement basis which meant he had to arrange for the required money up front. Being utterly disappointed, Amit sought to understand the difference between a mediclaim policy and a health insurance plan and finally realized that the mediclaim policy he purchased for his father is different than a regular medical insurance cover in many aspects. Aside from Amit, there are thousands of people in India that don't have a clear concept about mediclaim and more importantly, how it differs from a typical health insurance policy. Here is a detailed look at various facets of mediclaim policy to help you all make an informed decision while buying an insurance policy to avail financial protection from enormous medical expenses. A mediclaim plan is essentially an insurance policy that pays out the expenses incurred during hospitalization to the insured. The pay-out can be done either on reimbursement basis or on cashless basis. However, usually policyholders submit all the relevant bills when the hospitalization is over and get the expenses reimbursed (like what Amit did). In some cases, the mediclaim policy provider settles the deal directly with the hospital in question and facilitate policyholders with the scope to avail cashless treatment. What exactly a mediclaim policy covers? All expenses for treatment during hospitalization in the likes of medicines, OT charges, oxygen, blood, x-rays and expenses due to other diagnostic procedures are under the coverage. All expenses for getting admitted in either basic wards or in ICU are covered in a mediclaim policy. Expenses like fees of doctors, nurses, attendants and anaesthetists are taken care of in a mediclaim policy. How a mediclaim policy differs from a health insurance plan in India? Mediclaim policies only cover expenses during hospitalization. Health insurance plans offer wider coverage as it is not limited to only hospitalization expenses. It further covers pre and post hospitalization costs. Hospitalization is necessary to make claim for mediclaim policies. Hospitalization is not necessary to make a heath insurance claim in India. If the insured is diagnosed with a critical illness, he is eligible to make claims. The highest coverage available in a regular mediclaim policy is not more than Rs. 5 Lakhs. Health insurance plans come with extensive coverage. 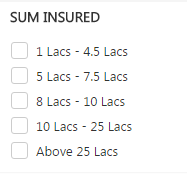 The maximum limit on sum insured can be over Rs. 50 Lakhs. Mediclaim policies pay out coverage amount on indemnity basis. The hospitalization expenses are reimbursed upon submitting relevant medical bills up to the limit mentioned in the policy document. Health insurance plans work on the principle of benefit. These plans pay out a lump sum amount when an eventuality occurs; be it an accident or diagnosis of an ailment. Policyholders can keep on making claims in case of a mediclaim policy till the exhaustion of of the sum insured amount. In case of critical illness cover, the total sum insured is paid out once in a lump some amount and the plan loses its effectiveness. There is no scope of making a second claim. How to make claims under a mediclaim policy? You can make 2 types of claims under a mediclaim policy; claims for reimbursement and cashless claims. Let's start with claim process to seek reimbursement of expenses due to hospitalization. In order to make a successful reimbursement claim, you need to keep your insurer or TPA informed about the hospitalization. The term 'hospital' is well defined and insurers don't honour reimbursement claims if the treatment is availed from medical facilities that don't match with their definition of hospital. After the hospitalization, you should keep a track of all the expenses incurred and keep all the bills arranged at one place. Then you have to fill up a claim form with correct information and submit it along with the bills of your expenditure. You should keep in mind that the claim form should not contain any false information otherwise your claim will be delayed or might even be rejected. A duly filled claim form attached with all necessary documents is the key to get your reimbursement claim approved. If there is a change in the purpose of hospitalization or simply, if the treatment procedure changes you need to seek a fresh approval. In case your claim is denied by your insurer you can ask for proper explanation. You can rightfully ask your mediclaim policy provider to cite those clauses on the basis of which your claim faced rejection. If you require to take the matter of claim rejection to a consumer forum, the details of claim rejection will be useful. Now that you are aware of the way you can get your hospitalization reimbursed through your mediclaim policy, it's time to gain information about cashless claims. You can make this type of claim for two types of hospitalization; planned and emergency hospitalization. Most policyholders prefer cashless treatment to reimbursement of medical expenses. You don't have to run from pillar to post to arrange the money for hospitalization, treatments, tests and all if your cashless claim gets approved. With the blessing of cashless facility, you don't have to pay a penny to the hospital. Here is what you need to do to get the required approval. First of all, you have to gather information on the list of hospital in the network of your mediclaim policy provider and select any hospital from the list in your vicinity for getting admitted. All the hospitals in the panel of your mediclaim provider have a desk to look after insurance claims. You can collect the pre-authorization form from the desk and have it filled with exact information and submitted back to the desk. The form you have filled up will then be signed and stamped by the doctor and hospital authorization. Once all formalities are over, the form will be sent to the TPA of your mediclaim provider. In case your insurer settles the claim directly, the form will be sent to your mediclaim policy provider in India. Finally, your insurer or TPA will evaluate the form and grant a specific sum. The hospital authorities will receive a fax from your TPA or insurer that informs them about the amount that has been sanctioned to undergo cashless treatment. It is understandable that you won't get time for filling up the pre-authorization form if the hospitalization takes place on emergency basis due to an accident. In that case. You will get 4 hours of time after the hospitalization to fill up and send the pre-authorization form. It's crucial to carry your any proof of your mediclaim all the while as you never know when a mishap may occur. If you decide to avail a mediclaim policy for yourself or your family you need to consider some vital factors to make an informed choice. Here are the most vital aspects that you have to keep into account while buying mediclaim plans. If you want to keep only yourself financially protected from exorbitant medical costs you can opt for individual mediclaim policy. If you have a family to look after and you want to keep all covered then your best bet is a family mediclaim policy. However, family mediclaim policy comes with a catch. The renewal of the cover is not possible if and when the eldest person expires or reaches a certain age even if the age of other members of family is eligible for coverage. As mentioned earlier, maximum renewal age is crucial and you should look for a mediclaim policy that comes with lifetime renewal option. As your age advances the chance of falling sick also increases and if your mediclaim policy don't protect you when you need it is of no use. All mediclaim policies impose a strict restriction when it comes to covering pre-existing ailments. There is invariably a waiting period of 2-4 years and you have to trace out mediclaim policies with minimum waiting period for pre-existing diseases. You also have to decide on the coverage amount. If you are opting for an individual mediclaim policy you can settle for Rs. 3-5 Lakhs of coverage amount. But, if you want to avail a family floater plan you should choose higher sum insured amount in the range of Rs. 8-10 Lakhs to cover all members of the family. While choosing the sum insured amount you need to keep the increasing rate of cost of medical treatments in mind and estimate how much you will have to spend on treatments 10-15 years down the line. How GIBL can help you buy the best mediclaim policy in India? Now that you know everything about mediclaim policy and keen on availing one soon, your best bet is buying mediclaim policy online from GIBL.IN. Being India's premiere online insurance marketplace, GIBL.IN facilitates potential policy buyers with an array of online mediclaim policy quotes upon submitting some basic details in the likes of name, city of residence, pin code. You simply have to select the coverage amount and the type of health policy you want. Aside from the scope to choose from a wide range of coverage, this online insurance comparison portal also allows for further customization. You can select features that you want in your medicliam policy and opt out the ones you don't need. 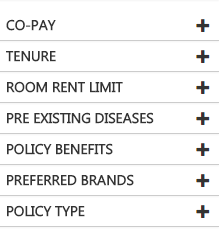 At GIBL.IN, you can customize your mediclaim policy online in terms of all the vital features such as co-pay, tenure, room rent limit, waiting period for pre-existing diseases. If you want various benefits in the likes of restore benefits, maternity benefits that come along with mediclaim plans you can also opt for them while comparing mediclaim covers. Furthermore, if you prefer any particular brand you can go for it and compare mediclaim plans on offer at your preferred mediclaim insurance providers. Mediclaim policies are typically classified in three categories; basic, comprehensive and advanced. 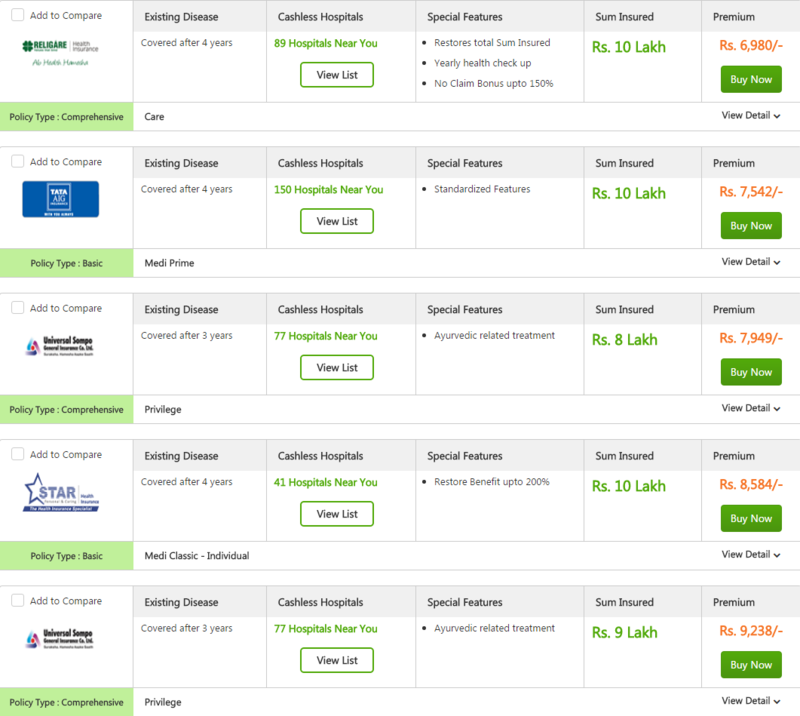 You can also select any of these types as per your budget and needs and continue with your online comparison of mediclaim policy with your chosen type of mediclaim plans. Kolkata. The chosen range of coverage is Rs. 8-10 Lakhs. The list of mediclaim policies also come with the number of hospitals in the network of the mediclaim cover provider. This helps one understand how strong are the networks of mediclaim insurance companies. You can also go through the list of hospitals in the panel for cashless treatments to locate one in your vicinity. Once you get a list like this you will get a summery of the mediclaim policy. You will get to know the waiting period for existing diseases, network of cashless hospitals and the premium for the sum insured amount. In order to gain information on the features the best mediclaim plans in details you can click on the 'view details'. Upon clicking, you can go through the essential, comfort and special features of each and every mediclaim cover on the list. Hence, GIBL.IN is clearly your one stop destination when it comes to comparing and buying mediclaim policies at the lowest price. You can rest assured of getting many other value-added services such as claim assistance policy renewal reminder and the likes if you resort to this online insurance comparison portal. So, without wasting your time you should start to compare mediclaim policy on GIBL.IN now.